There was a real buzz in Westborough, Ma yesterday, as football fans descended on Julios Liquors in preparation of Super Bowl Sunday. 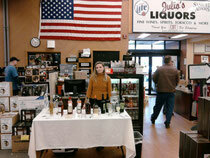 Julios has one of the best selections in the State of beer, wine and exceptional spirits for all occasions. They carry a good amount of products from the Heavenly Spirit portfolio and are doing a fantastic job with them. It was a pleasure to set up a tasting table there yesterday and get to know some of their clientele as well as their excellently trained staff. We offered tastings of one Cognac; Godet VS, three Armagnacs; Marie Duffau Napoleon, Delord Napoleon, & Artez Folle Blanche VSOP, one Calvados; Chauffe Coeur VSOP, our Peardise liqueur, and Absinthe La Muse Verte. We took a lot of questions about the differences of Armagnac and Cognac and had fun talking with all who came by. An unofficial poll of tasters showed an even split on who these New Englanders were rooting for in the Superbowl. Most predicted a high scoring "spirited" game.